Honours were shared at the 1st Feltham Christmas Tree Festival held at Christ Church in Feltham – an excellent initiative created to bring the Community together. 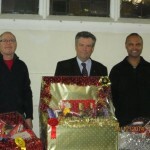 In total 17 local groups, schools and businesses designed trees and competed for the three prize hampers donated by Lodge Brothers of Feltham. ‘The high standard of entries made judging very difficult but the creativity was amazing and as a local family run-business with our Head Office in Feltham it makes us proud to support such a great Community Event’, said Lodge Brothers District Manager Quentin Edgington. Photo shows the Judges from left to right Frank Phillips,Quentin Edgington District Manager of Lodge Brothers of Feltham and Chris Netto.